Have you ever declined a request for hosting meetings at home because you just don’t know how to do it? Worried you won’t be able to accommodate a large amount of people? Or maybe you’re uncomfortable with having someone other than close friends and family inside your home? Read on because I’m going to show you exactly how to do this, the steps you need to prepare and how to be a great host – even if you don’t know everyone! You got this . . .
Is this a church gathering? Perhaps a neighborhood meeting? Or maybe for your kids’ school? Most likely, the invitation was sent by email, so ask for RSVPs by email too. You’ll get a better feedback if it’s easy for people to reply. Having 15 people versus 50 is a lot different, so the sooner you know how many to expect, the better. 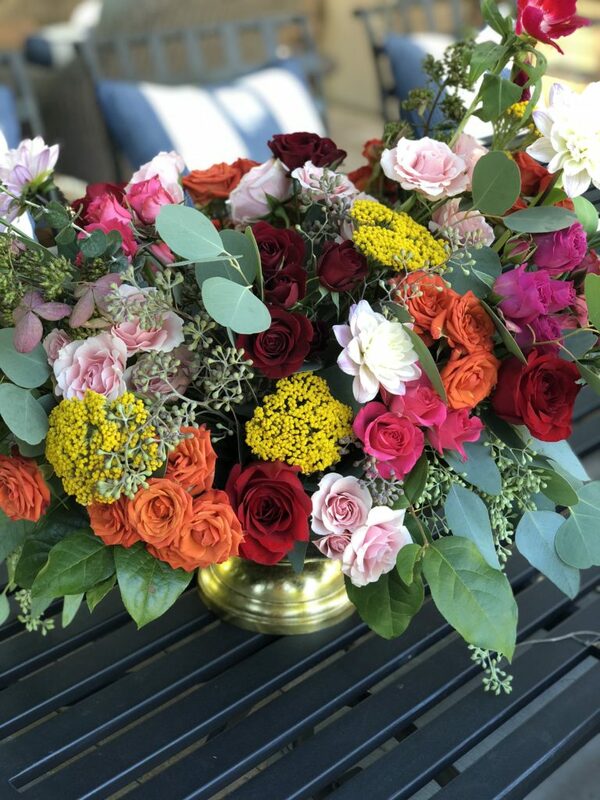 You can generally expect 30% of guests will decline an invitation, but be prepared to welcome even those who don’t RSVP! Pro tip: Put an end date for RSVPs rather than leaving it open. One week before the party is reasonable and you’ll be more likely to receive responses if guests know there is a deadline to reply. If you plan your meeting around meal times, your guests are more likely to assume that you are feeding them that meal. Therefore, chose an early morning meeting around 10am, afternoon around 2pm and evening later than 7:30 to avoid any confusion. Obviously weather will play a factor in determining if you hold you meeting indoor our outdoors. 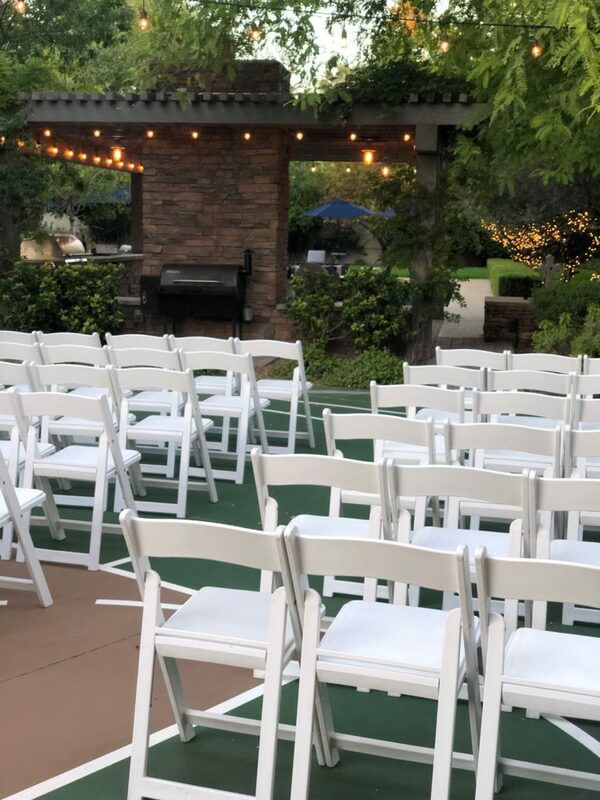 Consider lighting as well – if the event is at night, make sure you have plenty of light to illuminate any speakers and walkways to the event area. Perfect weather made it easy to host this meeting outside. 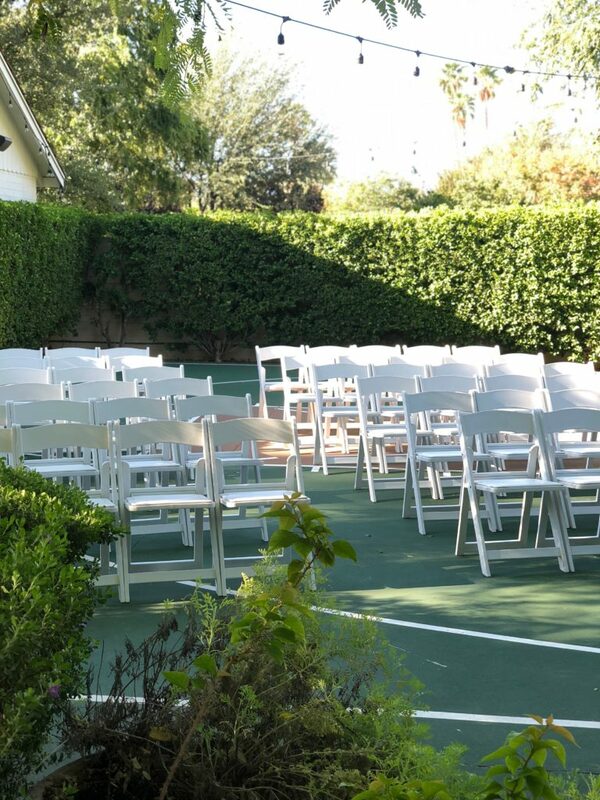 Our basketball court provided a stable ground for these folding chairs. Pro Tip: String lights are a great way to add ambiance without being too harsh and can be left up year-round. Make sure to provide an aisle down the middle if you are setting up a large amount of chairs for your meeting. Here, we did 6 rows of 10 chairs each, 5 on each side of the aisle. Pro Tip: Place chairs on a diagonal for added interest. 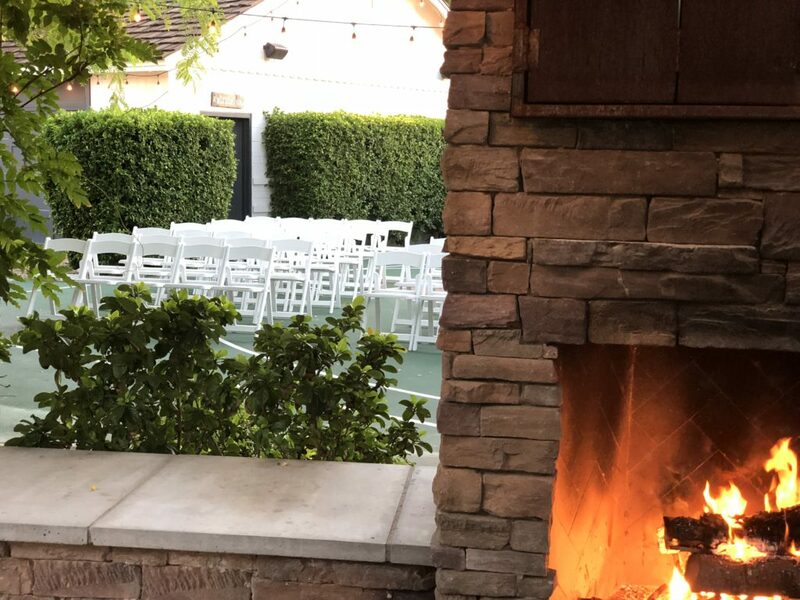 Also, if you need to rent a lot of chairs, pay a little extra to have the rental company set them up. It’s worth the time when you’re short on it! This couch can comfortably seat 4, but plan on 2 adults if they don’t know each other. Individual chairs are more efficient and can be placed behind the sofas. Seating may require some advanced planning. A living room is great and cozy for a smaller audience. Keep in mind that strangers are less likely to cram on a couch together, so you may only have 2 people on a couch made for 3-4 people. It’s perfectly fine to move furniture around to accommodate other chairs. You may need to rent chairs for your meeting – make sure you have measured the space to fit all of the chairs you will need for your guests. Wondering why in world someone would buy white sofas if they like to entertain? 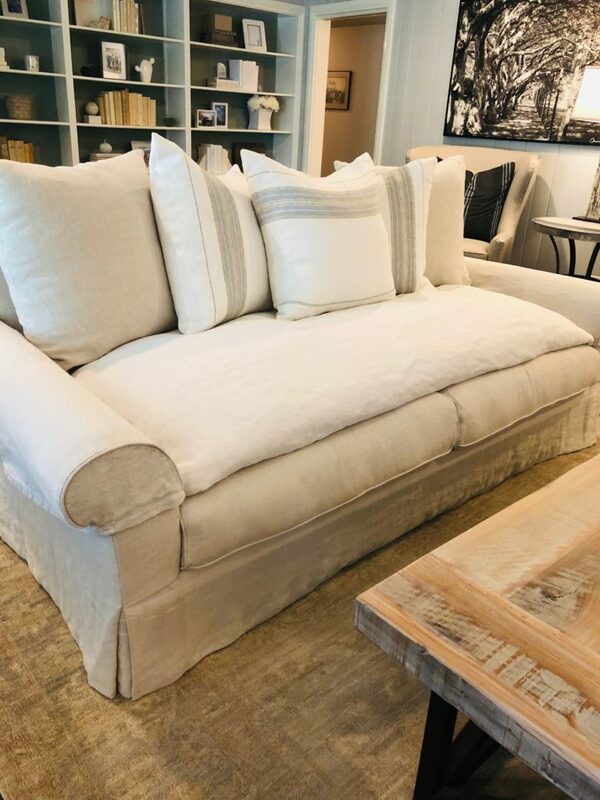 Check out my post on White Sofa Tricks! 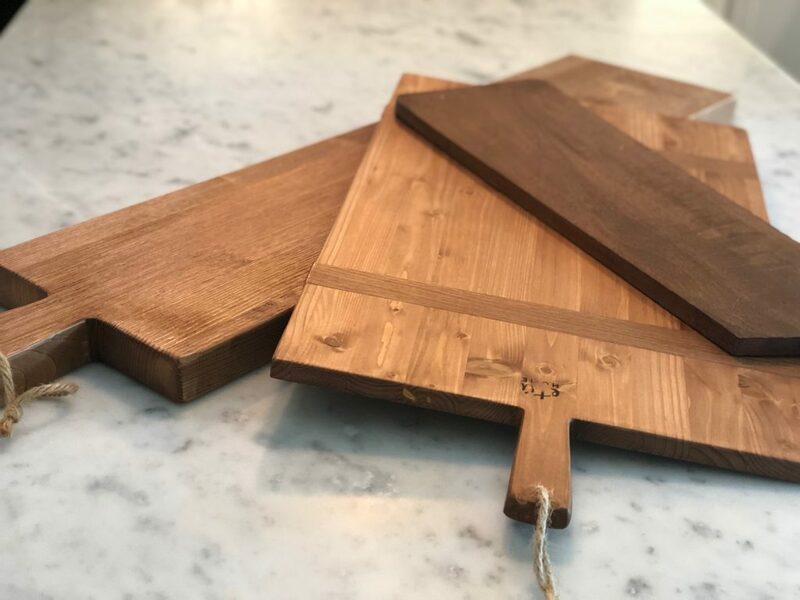 Consider delivering wooden boards or platters to the restaurant beforehand instead of using plastic take-out containers. Pro tip: Bring your own platters or boards if you are doing take-out. You won’t have to transfer then once you get home, saving you time and a mess! Less waste, too! 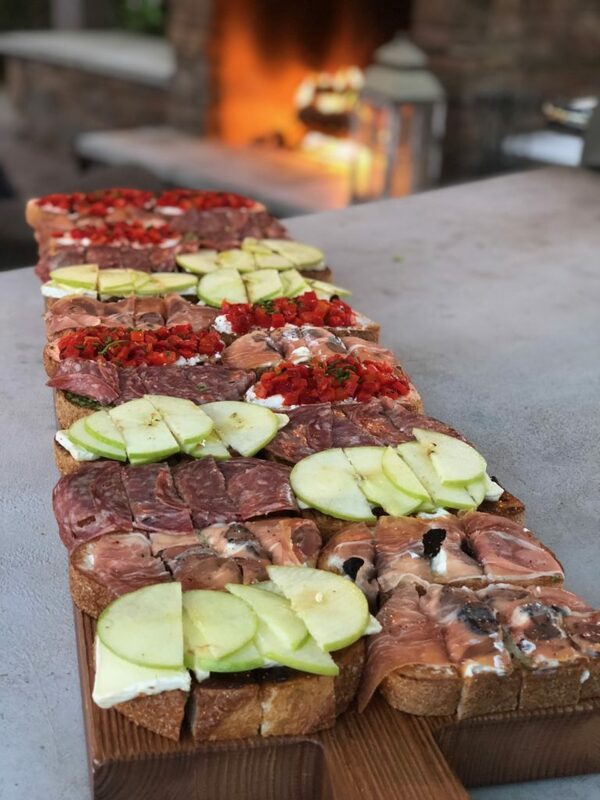 How amazing do these bruschetta look? No utensils needed! Pro tip: Most finger foods only require a napkin, which means less trash and waste! As far as beverages, keep it simple here and set up a beverage station. As a result, guests can serve themselves. Keep the beverages to a total of 3 for simplicity. For this party, I served water, beer & wine. An extra fridge is stocked with sodas and sparkling waters next to my garage for guests requesting those. 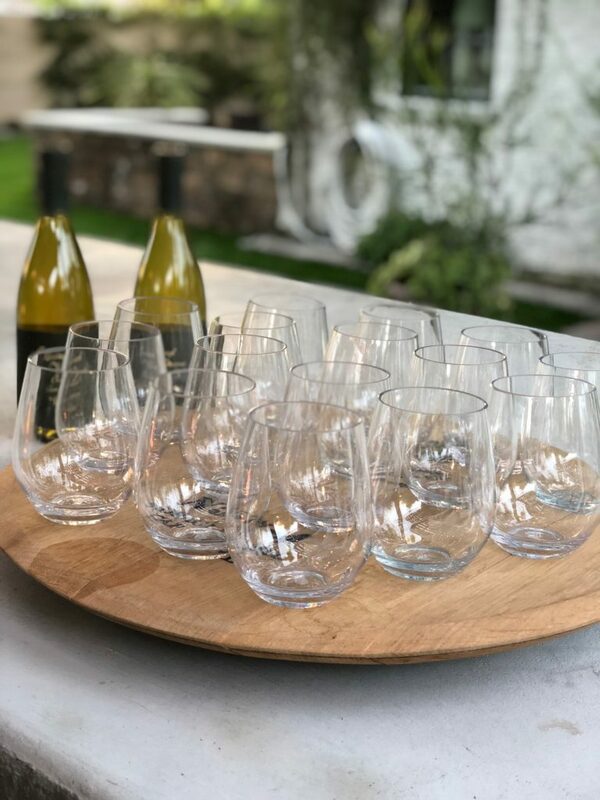 Acrylic stemless wine glasses are elegant and practical for outdoor use. 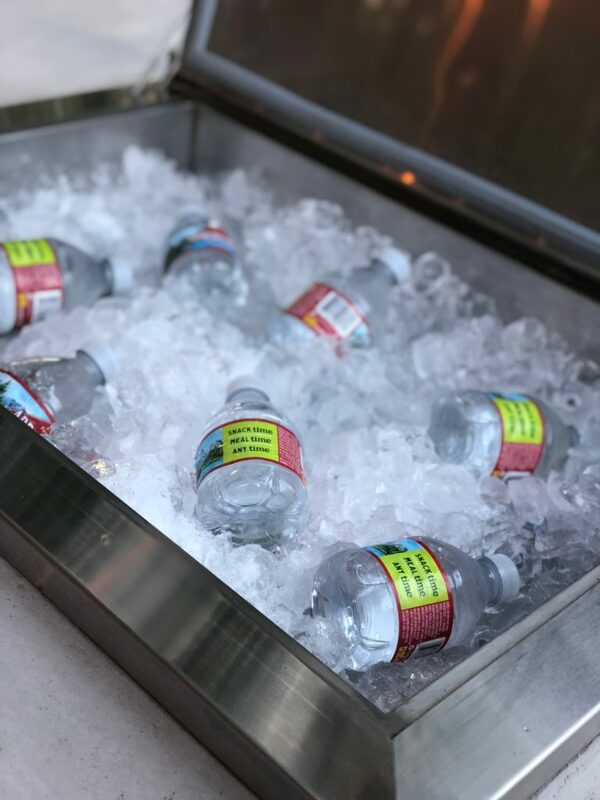 A drop-in ice chest holds several dozen water bottles – I like the small ones – and these stay cold for days, so I can stock this the day before the event. I love placing fresh flowers around the house -in the entry way, bathroom, kitchen and coffee table. This seems obvious, but make sure you have a well-stocked bathroom – Guests will appreciate having enough soap, toilet paper, hand towels, and won’t have to ask you for more half-way through the party. Light some pretty-smelling candles in your entry way and throughout your house for added ambiance. If I’m not standing at the front door to greet guests, I simply hang a door sign instructing them to “come in.” Direct your guests outside if that’s where the meeting is being held. Lastly, don’t forget the trash can. Place it in a corner, where it won’t be in the way, but where it is still accessible for trash. You don’t want your guests to have to search your home for a place to put their garbage.